“You will be pummeled by luxury,” my friend promised upon hearing that I’d be dining at The Grill with my brother and sister-in-law. Opened last year and tucked into the Seagram Building, The Grill is a “homage to midcentury luxe Continental dining” from the guys at Major Food Group (see: Parm, Carbone, Sadelle’s). Living in L.A., where a handful of midcentury dining rooms are still operating and in some cases thriving, The Grill’s premise wasn’t exactly novel to me, but I was still excited to experience a contemporary take on the genre. Everything old is new again. 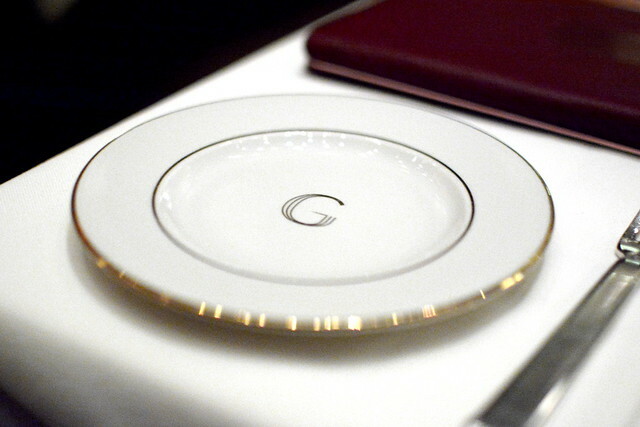 The Grill’s dining room is quite the golden, opulent site. 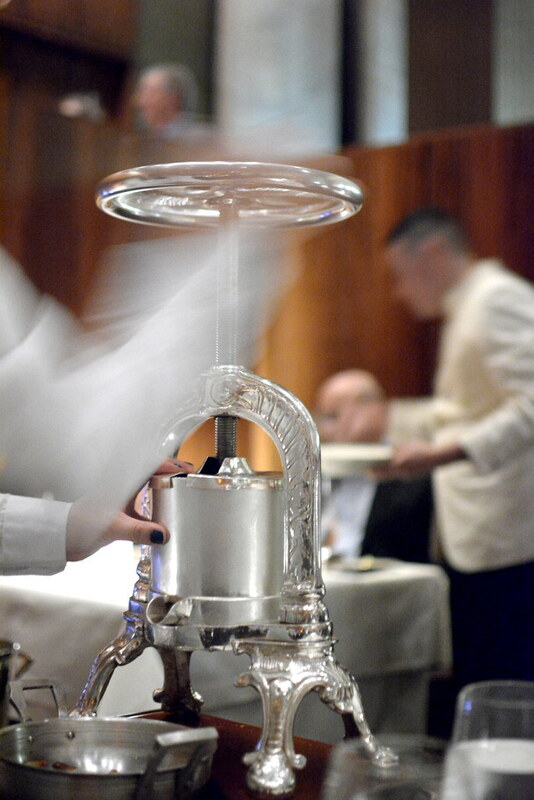 The restaurant’s interior was designated by the New York City Landmarks Preservation Commission as a landmark in 1989, and as a result it has remained largely unchanged since its construction in 1959. 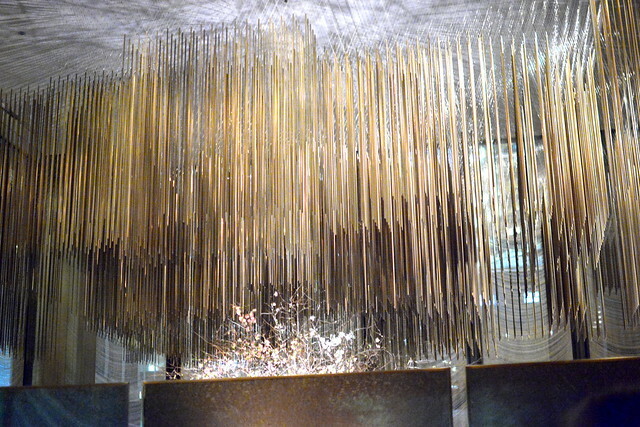 Hanging over the balcony and over the bar are shimmery sculptures by Richard Lippold (pictured above). 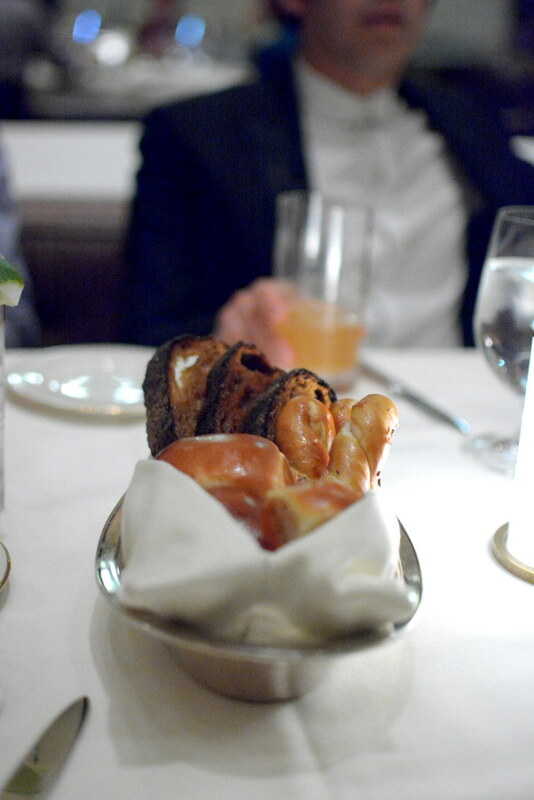 To start, a trio of irresistible breads (dinner rolls, pretzel breadsticks, and slices from a brown loaf) served with equally irresistible chive butter. This was the kind of bread basket that had us all reaching for more even though we knew better than to fill up so early on. 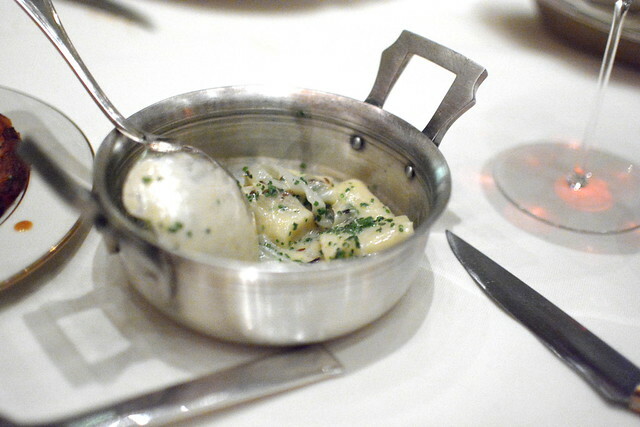 Of the evening’s four appetizers, the “Pasta a la Presse” was the most show-stopping with its 19th century fowl flesh and bone crusher. 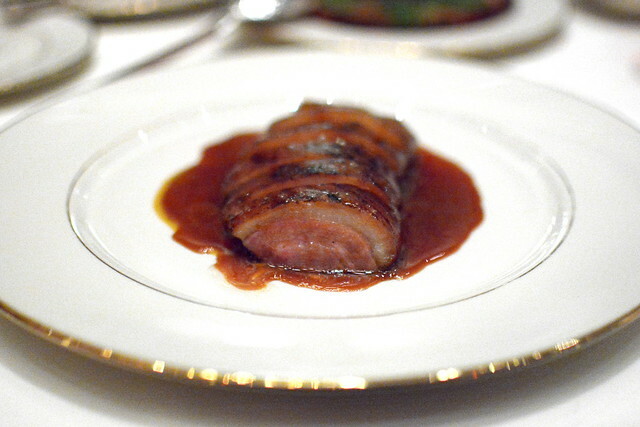 As the server cranked the press round and round, the juices from the various roasted birds (pheasant, squab, and duck) were extracted and collected. 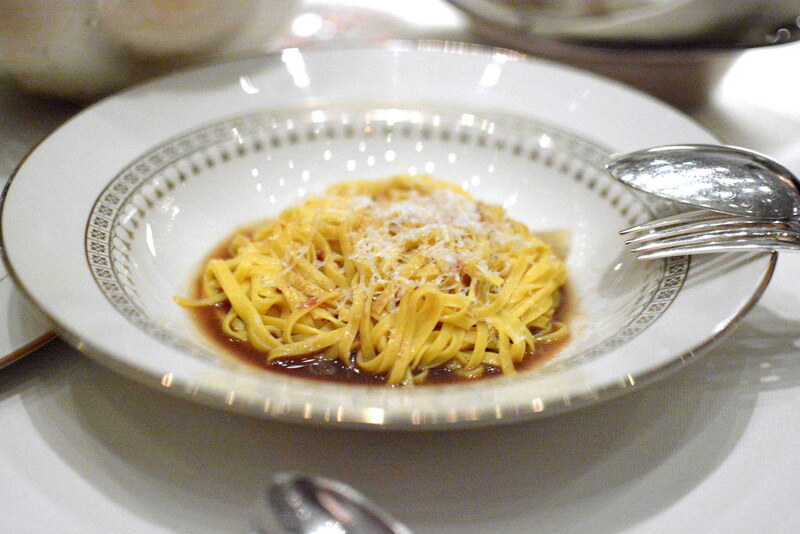 The juices were wheeled into the kitchen where they were tossed with fresh egg noodles. 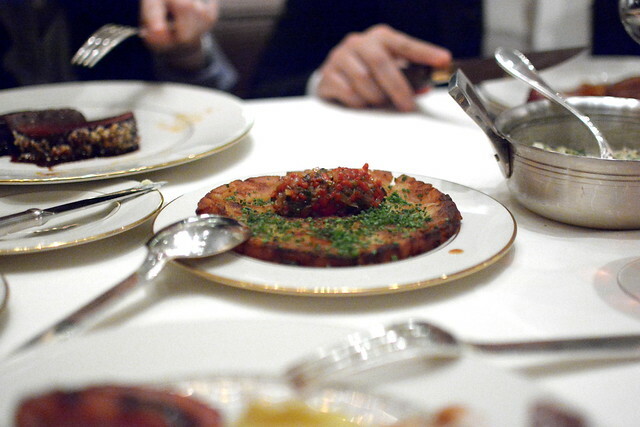 The completed dish was delivered to the table to pleased forks all around. 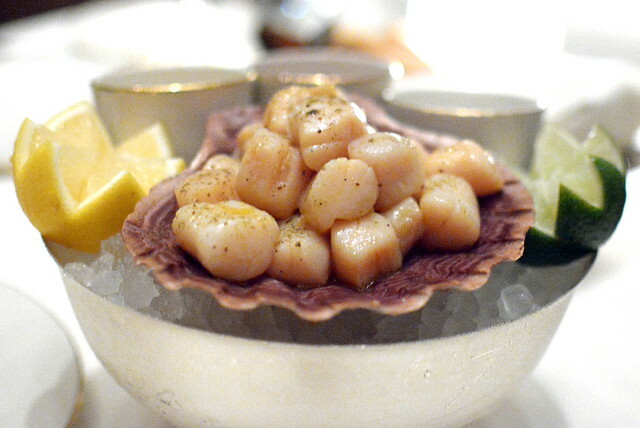 The day’s chilled crustacean featured fresh and firm bay scallops with a trio of sauces. 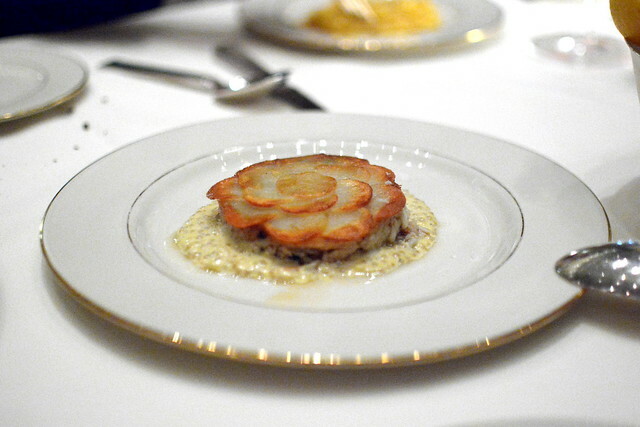 “The Seagram Crab Cake,” a favorite of my brother’s from a previous visit,” was comprised mostly of crabmeat and served under crisp-golden potato slices. 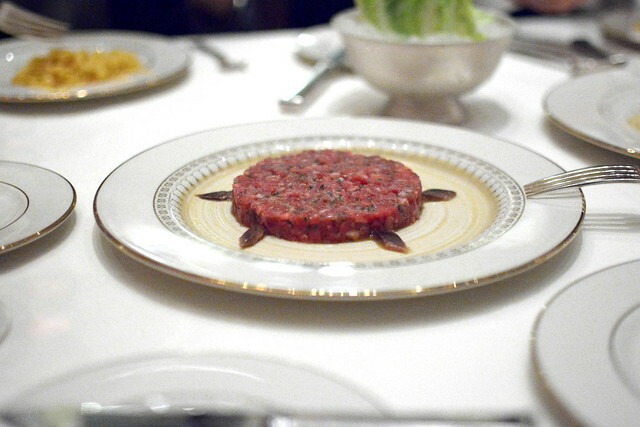 And finally, the “Steak and Anchovy Tartare.” Raw meat and pungent anchovies go together like peas and carrots. 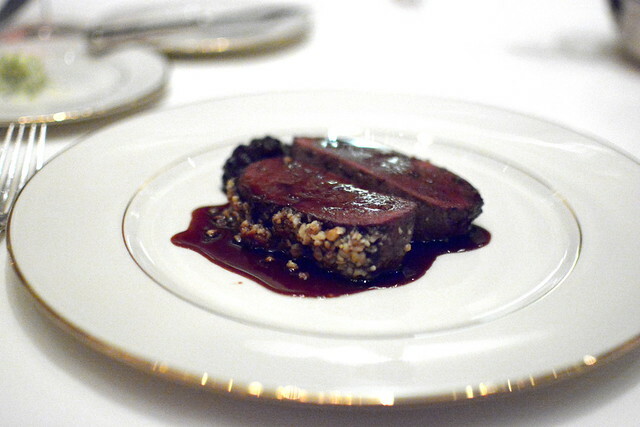 Moving on to main dishes, my sis-in-law settled on the “Venison Cumberland”—two beauteously tender hunks of meat adorned with walnuts and sweetened with huckleberries. I couldn’t resist ordering the “Amish Ham Steak” with pickled pineapple, because I’ve adored ham and pineapple served together for as long as I can remember. Brined, cooked, smoked, glazed, and caramelized, the heritage ham had a sweet yet savory way about it. 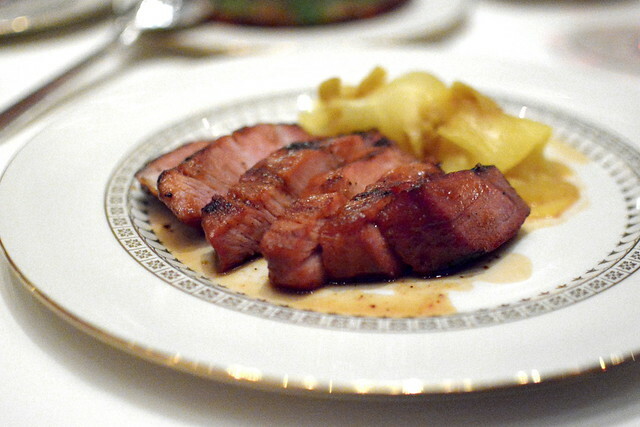 This was quite possibly the platonic ideal of ham and pineapple. 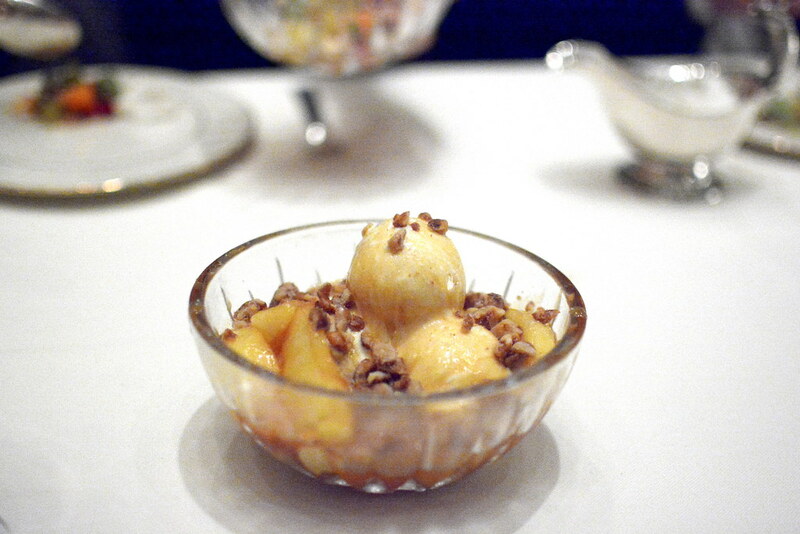 To finish, two desserts including an “Apple Melba,” which consisted of caramelized apples served atop scoops of vanilla ice cream. 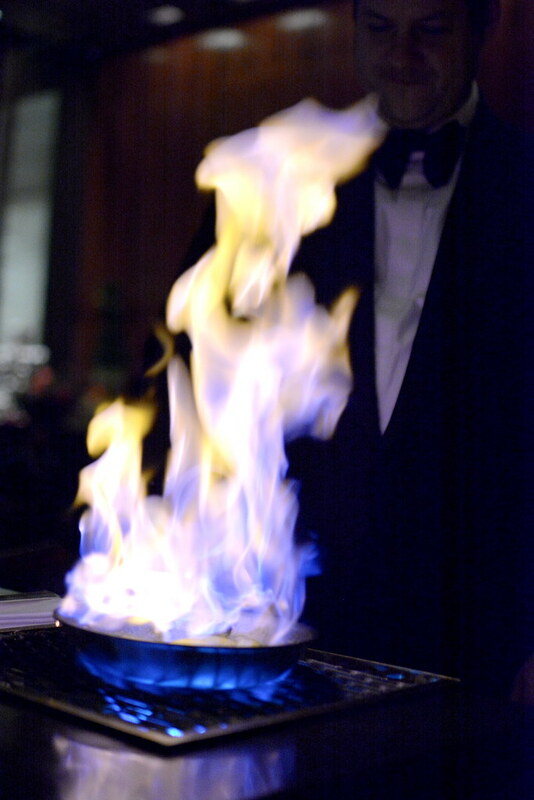 The “Apple Melba” included a tableside pyrotechnic extravaganza. 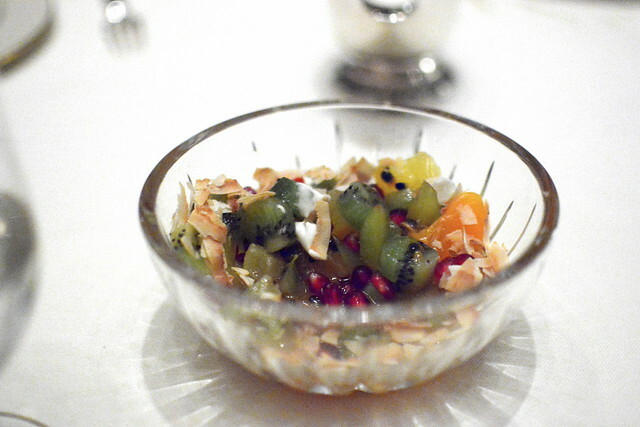 We also shared the “Ambrosia,” a collection of fresh passion fruit, pomegranate, kiwi, pineapple, and mandarins served with coconut whipped cream and toasted flecked coconut. My friend was right. I was indeed pummeled by luxury.